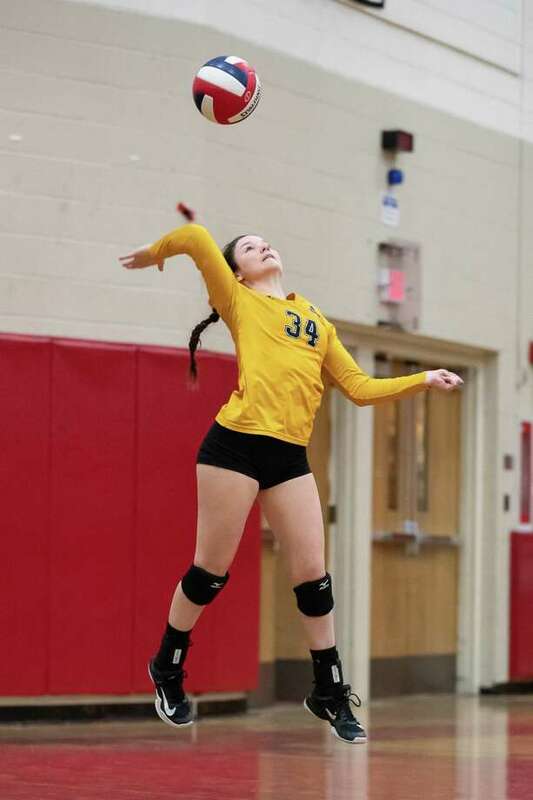 Olivia Pisano (34) of Amity, serves the ball in a Class LL Semifinal game between Amity and Westhill on November 14, 2018 at Warde High School in Fairfield, CT.
FAIRFIELD — There are nights when your best efforts aren’t enough for victory. The Westhill High School girls volleyball team played well Wednesday night. However, Amity High School was superb. And superb is what works in the Class LL state semifinals. No. 10 seed Amity posted a 3-0 (26-24, 25-23, 25-20) triumph over No. 3 seed Westhill Wednesday night at the Fairfield Warde High School gym. The victory means Amity (19-6 overall) will return to the Class LL volleyball final for the second straight year. The Spartans will faceNo. 12 seed Darien in Saturday’s 10 a.m. final at East Haven High School. It has been a marvelous run back to the LL final for the Spartans. For the first time in four meetings this season, Amity vanquished rival Cheshire High, 3-2 in the LL quarterfinals. In Game 1, Amity grabbed a 21-17 edge and 23-20 lead. But Westhill forged ties at 23-23 and 24-24. But Amity responded to win 26-24. In Game 2, Westhill led 5-2, 14-4, 17-9 and 21-18. But Amity fashioned a 7-2 surge for a 25-23 win and a 2-0 lead. Amity held a height advantage across the frontline. And the Spartans’ blocking and power kills wore Westhill down. Game 3 had an air of inevitability. From 6-6, Amity moved to leads of 18-9 and 24-16. Match point was elusive until Harbinson had her final power kill for 25-20 and a retutn to the LL final. Finishing a season at 22-4 overall and reaching the FCIAC Tourney final and the LL semifinals was an accomplishment for Westhill, which graduates just three seniors (Nikki Newcomer, Nina Bakuradze and Elsa Amiti). Records: Amity 19-6 overall, Westhill 22-4 overall. Highlights: A—Abigail Harbinson 13 kills, 3 blocks. Zoe DiZenzo 26 assists. Caroline Fertman 4 blocks. W—Nikki Newcomer 17 digs, 7 kills. Nina Bakuradze 16 digs. Sophia Thagouras 12 assists, 4 digs, 5 kills, 7 service points. Betsy Sachs 7 kills. Vana Servios 14 assists, 5 digs, 6 service points.